We already wrote about how important it is to get your book cover design right: first impressions count, as you might not get a second chance. In case you missed it, you can see some book cover examples and read more about 3D covers here. There is an important detail that many people overlook when designing their book cover (or when deciding whether to accept a proposed book cover design): the typeface. Don’t look puzzled: just because you are not likely to pay any attention to them, fonts still do matter. Have you ever felt when looking at a piece of advertisement that there is something wrong with it, but you cannot tell it’s cause? The font needs to match the genre and your style. It is easy to get it wrong but can be a great tool emphasizing your message. You can hire the best photographer or artist to create your book cover picture, but if you don’t get your typography right, your book is still going to look cheap or out of genre. When bringing a book to the market, you want people to think that you put a lot of effort into publishing it. If it looks cheap, they will think you don’t care enough. In this article, we are going to guide you through the process of choosing the best font for your cover with great examples. Starting with general rules, we are going to analyze the trends of the most popular genres to give you the best advice possible. If you think we missed something, or have some nice covers to show off, please do not hesitate to leave a comment. We thought it is best to get the nasty part out of the way: make sure your font is free to use, or pay for the one you really need. You definitely wouldn’t want somebody to just use your book however they like – and neither do typographers. So make sure you read the small print and check if the font is free to use for commercial purposes. Most typefaces come with a built-in theft check feature: you can use them on your computer, but cannot embed them into a pdf (and that is needed for your cover to look the same on every computer and even in print). If you are not sure, you can easily find out who owns the font (it can be the designer or a company) and ask them to clarify. There is a lot more variety in commercial fonts and sometimes you might have to purchase one, but you can find a list of nice free to use font collections at the end of this article. There are two different categories of typefaces: text or display. Some fonts are designed for several blocks of written text, and they must be both aesthetic and legible. They work best between 6pt and 14pt (points). And some fonts are designed to look better while displaying a message, creating a certain feeling or impression. They draw attention. They work well when used in larger sizes. 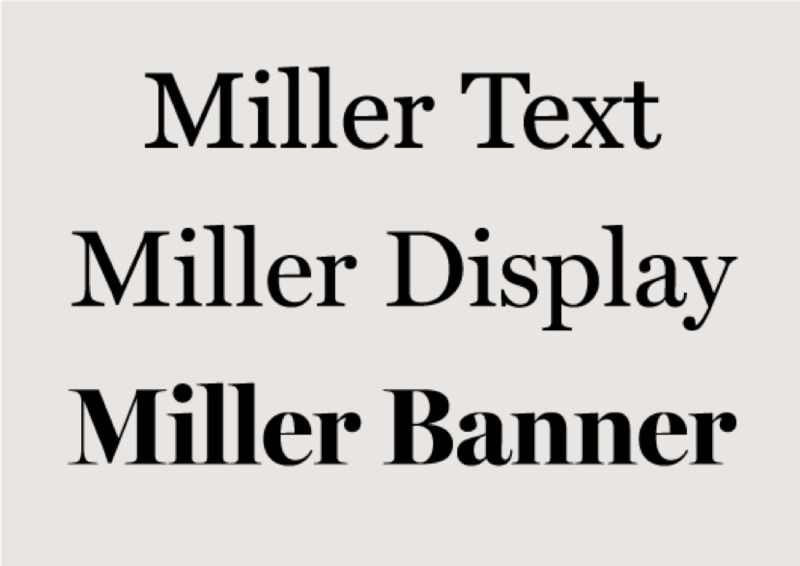 Many fonts available have both text and display variants: they look the same at first, but the important difference lies in the small details. The fonts.com website has a perfect example of a font which has a text, a display and a banner variation. The display version seems much lighter. This is why it is advisable to choose a display font, as you are aiming for a large font size on your book cover. Did we say large? Yes, when it comes to titles, size matters. You want your title to be legible even in a thumbnail. Don’t be afraid that it covers your carefully chosen book cover image (but you can play around that with a smart layout, which you’ll see in the next chapter). There is a last core rule: do not play with the typefaces. Do not stretch them or try to change them in any other way. These fonts are carefully designed to look perfect (as a text or as a block), so if you disorientate them, the results are likely to look bad. (Little tricks are allowed, though, especially if your primary language of publication is not English: we all know of missing ő-s and ű-s, or other tricky letters which can be easily created with InDesign – I’ll share the trick another time.) Most fonts come with different weights, more than just simple bold or italic; if your font can’t do what you want from it, use a different one. There is an area, though, where you are likely to have to manipulate your font: the kerning. The spacing between the letters is not only important for aesthetic reasons; poor kerning can cause letters or even words to grow together in a way it wasn’t intended. Moving on to the fun part. 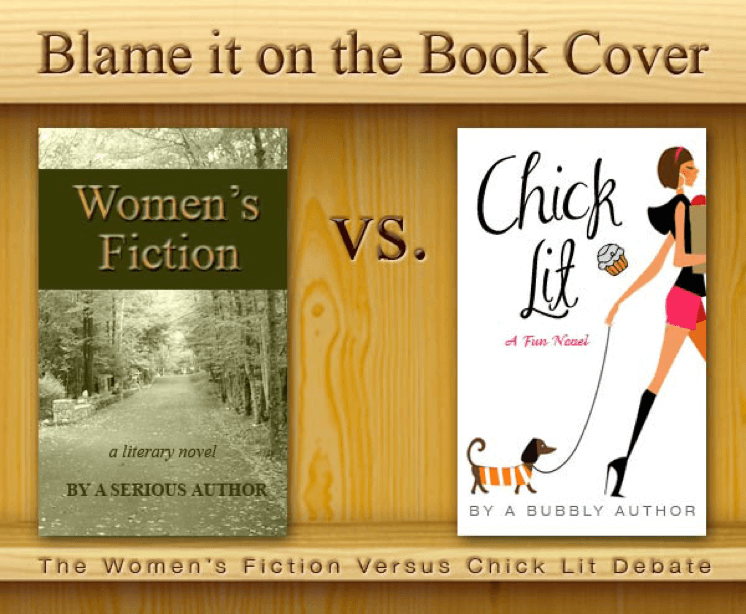 As it is with everything in the book industry, no hard rules are defining your cover layout. We can give you one piece of advice though: sometimes less is more. Yes, you want your book cover to stand out and to be unique, but sometimes the simplest typeface will do the trick. In the following, we show you great book cover examples where the uniqueness lies not in the selection per se, but in other typographic solutions. Try playing around with different versions of the same font for author and title: bold for the title and roman for the author (roman is the proper term for a non-bold, non-italic typeface). On the novel The Light Between Oceans, the same font is used for the author’s name as for the title. Small, weightless words, like “the” could be well played with, as you see it being cursive and differently cased. Note that the designer here plays with space: the emptiness creates the illusion of lightness for the origami butterfly. The added review pieces could also bring extra attention if you keep them subtle enough. Us and Look Who’s Back are perfect examples of how a well-placed title and original typography can be the fundamental (or the only!) element of a cover. Don’t be afraid to experiment and try different alignments. As you already see from the examples above, no strict rules are defining the placement of the author and title. The author’s name can be at the top or the bottom, the title can either be at the top, center or bottom. Don’t forget: the most important is to get it to harmonize with your cover image, your genre, and your style. For inspiration and good examples, check your favorite books, go to a bookstore or just search “beautiful covers” (as you most certainly already did). The best advice we can give you on this topic is the following: use the main tropes of your genre to guide your readers and help them discover you. Based on the cover, they have to be able to guess what to expect when opening your book, or it should be tempting enough to be interested in it. And then hook them with something that is special and makes you stand out from the thousands of other books in your submarket. The only downfall is that we didn’t come across one we would be happy to use. Most of them bring out my childhood memories of WordArt: if you are too young to remember, the built-in Word function enabled people to quickly turn their text into fancy, colourful, 3D logos. It’s best not to use them. Do not use any effect either. 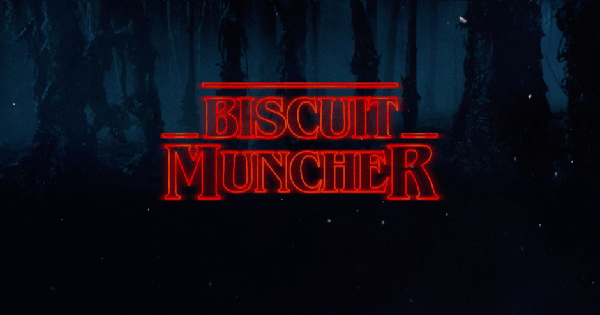 If you want your title to be written in the style of Stranger Things, there are websites that can do the trick, but it is inelegant and likely to be illegal. So far, the only website we think worth mentioning is the 1001 fonts: this is not a generator per se, but it lets you use your own text when previewing the fonts, which is rather useful. The daunting task of curating and compiling hundreds of fonts into genre themed pictures has been beautifully done by Derek Murphy and is perfect as it is. He doesn’t say anything about his selection method, however, which is pretty significant if you set out to find your own cover font. We do. (Please bear in mind that we mostly monitor the English and US market. The trends can be completely different in other countries.) In the following, we help you to find the most beautiful book cover fonts by genre with great examples.. The least we can give is a simple rule: use sans-serif. Most designers of the best non-fiction book covers do. Sans-serif fonts suggest modernity, honesty (well, at least for me they do, but there must be a reason why they are so popular). They look straightforward and professional – and this is exactly how you would like to be perceived when publishing a non-fiction. The current trend is the extreme use of bright colours and a light background. All of the above examples have a balanced, symmetrical layout (I really like the diagonal cut of the Graham book), with center-aligned titles. All titles are capitalized entirely. The designer of the Stalin book chose a “communist feel” font to emphasize the theme and set the function words (“and the”) a couple of points smaller. The first font we tried out is Route 159, which is free for commercial use. The package contains light, regular, bold, heavy and italic versions and a combination of these; we chose heavy. A font like this works very well even if used in inverse, putting a pattern under them on a blank cover. Widolte light is not free, therefore you can only see the demo version. 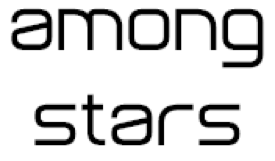 We used this simple type to show a bad example of placement: if your title resembles a humming top, change something. Look away now, if horror is not your genre because the following images might be disturbing for some. Blood, ghosts, bones, and Victorian dolls: all well-used elements of the horror book market. When it comes to typefaces, a bit of fading, some blood drops or fangs can add some spookiness to your cover. Don’t overdo it, though: if the font has some letters with additional drawing, it only looks good if the letter doesn’t repeat within the title (for this, see examples below). Depending on which age your horror is set in, goth fonts can work very well; or the simplest sans-serif for a modern setting. 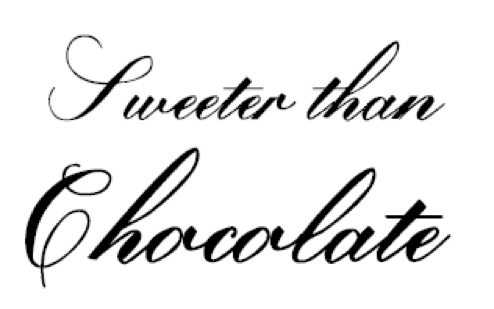 I used the font called Cocaine Sans for this text: it is a great font, free to use, but notice how silly the two T-s look next to each other. A font like this only works if your title contains different letters only. On this note, I definitely would not pay $60 for a cover like the Hellhole below, straight from The Book Cover Designer website. They don’t specify the font, but it would work much better if only one of the L-s would be fancy. Nightmare 5 is such a great font that we were happy to use it for spelling out our biggest nightmare. It fades and has a grunge quality, but is still easy to read, and has a bit of Scooby-Doo-y playfulness. It is free for private use, but you must purchase it for commercial use. The Kevin Brockmeier book is an excellent example of the typeface being unnoticeable. The placement draws your attention to the middle of the picture, so at first, you might not even notice what is so spooky about this cover. The title is in all capitals (it is ok for horror, but not advisable every genre) and sans-serif, combined with the author’s name in serif. Horror covers usually use dark backgrounds and “spiky” decorations, tall fonts, just like on the cover of the Palahniuk book. This cover is a fantastic example of how a good font supports the cover picture. You might have to hire a professional for a cover like that unless you have a very talented friend whom you can bribe with chocolate. The rules are much less specific when it comes to comic books, as it is more of a medium than a genre: there are horror comic books, romantic comic books, non-fiction comic books, classic superhero comics, graphic novels, manga and so many more. The designer has to place the book not only within the medium, but also the different subgenre; not to forget the difficult choice regarding the fonts (a different one for main text, one for non-human sounds, several for signage) within the book. What we said about style, is even more relevant for comics. Pick the craziest fonts for the cover, bright colors, usually all caps, title almost exclusively on the top or in the upper middle part (so it is easy to flip through them in a comic book store). For this, we can’t recommend a font, but provide a selection of our favorite comic book covers. Yes, we know that these covers go against everything we stated so far. Neil Gaiman’s name is written vertically, which would be a big No for most genres. On the next cover, at least two different types are used, and both are serif. This violates the first rule of typography: do not use two conflicting fonts. On a comic book, it works. Persepolis is a great example of how the simplest font can show off on the cover if it matches the image in style. The title of the Atwood comic has a yellow shadow to make it pop out of the picture; while it would not work for most genres and is widely resented, it is not the same regarding comic books. Let’s change the pattern and start with some terrible examples. We need to warn you: these are all real books available on Amazon that came out recently. We now have to repeat the obvious: make your title BIG. Even on the real sized cover, we can hardly read the title and the author of the second book. Please drop Comic Sans and don’t use black on a dark background. Same goes for the third book: drop Comic Sans. It is silly to use a font to sell a product, which is hated by enough people for the BBC to write about it. The fourth book might be appealing to the German audience, but the use of four different fonts is distracting. There is also too much information on the cover: five lines, all different colors, each used with different effect. This out of the way, let’s talk about tendencies. Warm colors, ornamental, serif fonts are a must. Handwritten, calligraphic fonts could also work, if you make sure that it is still readable. I like Lavenda (free for private use) for no apparent reason. 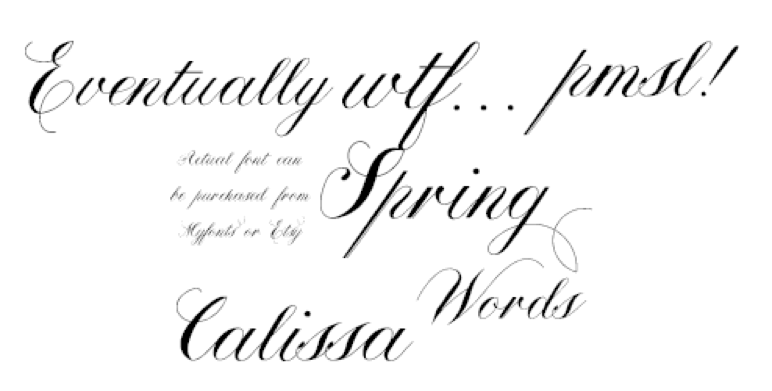 It is a simple, lovely and easy to read handwritten font. For a younger audience, teen romance, LT Chickenhawk is a perfect choice. The genre also calls for no capitalization. It is best if we just stop here for a second. The WOW! (Women on Writing) has published a compelling article about how covers are the main tool in dividing the market into women’s fiction (“serious literature”) and chick lit (“easy read”). You can use this opposition for your own advantage by designing your cover bearing in mind what you want people to think of it and where on the market would you like to be positioned. Okay, this is an easy one again: there are tons of futuristic, light, sans-serif fonts on the market. Sci-fi books usually come with a dark cover and light title, using pastel colors. If you want to see some horrible examples, there is a whole website dedicated to them (also includes fantasy books, but usually showing vintage editions), but we are only going to show nice ones. The rounded, thick sans-serif fonts and all capitals for both the author’s name and the title make these covers similar. The layout of the cover is not strictly set. It is purposefully deceptive; it makes you expect something from the 1800s: a serif font, traditional author – title placement, ornamental pattern under the title. The readers it aims to reach are not the “traditional” sci-fi audience, but whoever would take the Memoirs of a Geisha off the shelves. Not Just Groovy (free for personal use) is my favorite of all fonts listed in this article, and I can’t think of a book on which it wouldn’t look good. The use of all lowercase is also common for sci-fi. 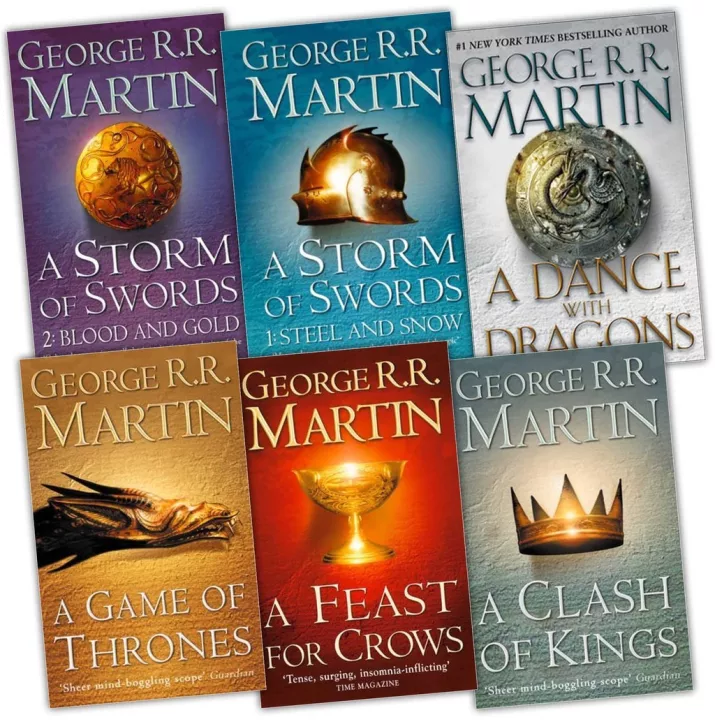 Great fantasy books (luckily for us, readers) always come in series. A well chosen font and placement will make your book recognizable from far away: your fans will instantly spot your book anywhere. 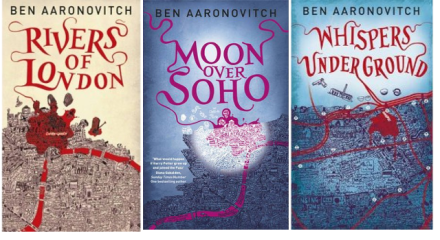 Some examples below include the great urban fantasy series of Ben Aaronovitch and everyone’s favourite epos by George R. R. Martin. I’m sure you get the idea. These authors succeeded in building a brand for the author, because the book covers follow a theme, a structure: same typeface, similar alignment, different colour scheme. (Which is great if you spot somebody reading them on the underground.) Even if you are not planning to write a series of books, it helps if your fantasy book covers share some design elements. For a fantasy book, your cover has to convey the mood of the book. It also helps if your cover image orients the reader: when and where in the fictional world are we? Is it hot or cold? Is there magic? But remember to never disclose too much, don’t ruin your readers’ surprise and journey of discovery. Optimus Princeps (left) is a great serif, all caps font. It is ideal for all your fantasy needs from Middle Earth to Gilead. Oranienbaum (right) is a well balanced, light and modern serif font which would look great on any urban fantasy or anything set after an imaginary 19. century. We already wrote about self-publishing a children’s book, but didn’t talk about cover fonts in that article. No wonder: this is such a huge category, it includes books from toddlers to pre-teens. However, there are a couple of guidelines. 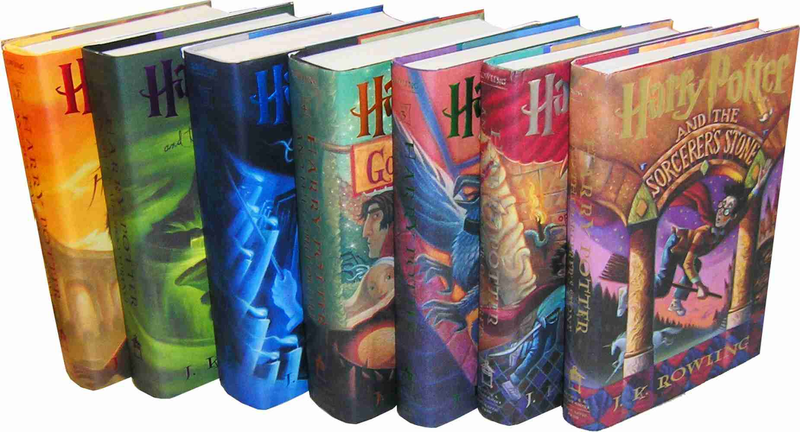 Children’s books, similar to fantasy books, are likely to come in series. Aim for a unique style, a brand you can keep and which mums and kids easily recognise. You can use bold colours and creative, handwritten-style fonts. 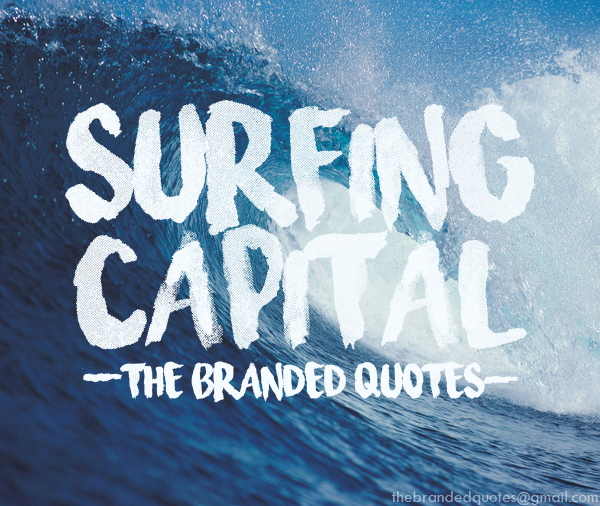 Surfing Capital is an amazing, brush-like font in all caps. I can easily imagine it used on a book for a toddler or pre-schooler. The letters are easy to read, which can also be important. Bakery is an amazing free for personal use script with great ligatures and a wide range of possible usages. It is not as easy to read as the previous one, but kids from 8-9 years old will likely be able to tackle with it. All in all: try to find the balance in book cover design. Try out different typefaces and layouts, until your book is great to look at (and your title is legible in thumbnail size). There is obviously no one-size-fits-all solution for your typography problems, but trained eyes will easily notice if something is about to go terribly off. If you are still with us, you deserve to check our list of free or easy to buy font collections we came across. Thanks for reading and please use the comments section to share everything we don’t know about. Happy publishing! MyFonts – A collection of the best-known typefaces globally. The fonts are free to try but come with a charge if you want to use them. Behance Free Fonts – Amazing fonts shared by the design giant Adobe. 1001 Fonts and Dafont – Huge collections of fonts with straightforward signage of licensing and direct link to the designers. Bonus points for the Donate button. Font Squirrel – A beautiful selection of free for commercial use fonts. Motto: who has time to pick from thousands? CreativeBloq – With descriptions as specified as “high-contrast serif display fonts,” this website has something for everyone. CreativeMarket – Very reasonably priced premium fonts for nearly any genre. They also have design assets, including stock photos, social media templates, Photoshop actions, and more. After Selecting a Font, Take the Next Step! Once you’ve found the perfect font, you can take the next step and design your book cover. While it’s always best to hire a professional, there are many affordable options and even free DIY resources available. Read our guide to creating a book cover for free, and then sign up for PublishDrive to start distributing your beautiful ebook to over 400 stores worldwide! There’s a lot of innovation and experimentation happening in the Indian book publishing industry. In this article, you will learn how the book market and the self-publishing industry works in India. Which is expected to explode very soon! You can read some useful tips how to publish a book in India and about the whole self-publishing process which we cover here through a success story. The book industry worth over 7 billion dollar approximately and growing at around 20% every year. The Indian book market can be described in one word: complex. As the 6th biggest market in the world by GDP, the economy is thriving. There are higher literacy levels, and the book market is getting ready for ebooks. Behind the US and UK, India ranks 3rd in the world in English language publishing. In fact, it is one of the very few markets globally that is still increasing in both print and digital publishing. The market in India is extremely fragmented, demographically. There are 22 official languages, English is one of them, but Hindi is the most common one. There are 122 major languages and close to 1600 additional ones. Languages are thriving in India, for instance, you can expect a renewed interest in buying and reading Hindi books. Marathi, Malyalam, Bengali, Telugu and Tamil languages also have a strong culture of reading. The fragmented nature of publishing comes from the diverse social and economic levels across the country and from the fact that a few large retail chains are dominating the market while there are hundreds of small, independent bookstores and unorganized retailers. There’s not much publishing data coming in from the Indian market, which makes it harder to represent the market and create a full study on the subject. However, Nielsen has a report about the Indian book market that tries to quantify a complex market. There are still issues though such as the fact that a large number of publishers, especially in Indian languages do not use ISBNs. Another problem is that the market is still fragmented and lacks marketing and distribution support for self-publishers. However, a consolidation has already started thanks to the government that allows a 100% foreign direct investment resulting in the involvement of foreign multinationals. Amazon’s purchase of Westland, which is one of the top publishing houses in India, is a great example of this consolidation process. The growing population of the youth, who is becoming literate and educated, brings a tremendous opportunity for market growth in the publishing industry, especially in the educational sector. No surprise that educational books dominate the overall Indian book market with 70%. The other 30% of books published are trade books. However, in monetary terms, academic books account for 40% of sales, trade books account for 30% and the remaining are children books. About 50,000 publishers publish a volume of 120,000 books each year, nearly half of the titles are in Hindi and English. This puts India at the 7th rank globally in terms of the number of books published. The biggest players on the market are Amazon and Flipkart. The business model of Amazon in India differs from the one in the US. While in America Amazon has two business models: ecommerce and it is a marketplace for third party sellers. In India however, Amazon.in needed to develop multiple business models because of the characteristics of the market. Flipkart’s ebooks catalogue was bought by Rakuten (Kobo) in 2015, so there should be exciting strategic developments in the future. The internet penetration is growing fast; the online market is globally among the fastest growing ones in India which manifest in more content consuming online and through devices, especially mobile phones. When it comes to accessing the internet, India is a mobile-first country with 900 million users of whom 42% have already purchased digital content. 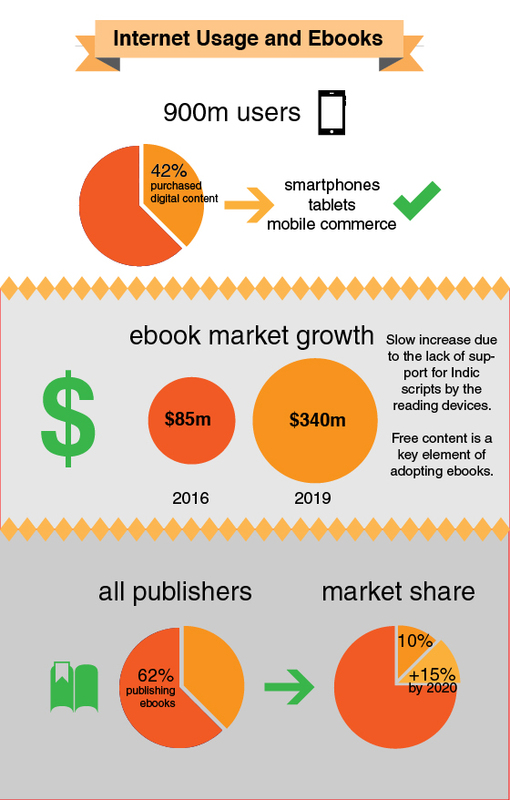 Thus ebook sales are driven by smartphones, tablets and mobile commerce. As the Indian ebook market gets more and more mature, e-reader devices are picking up slowly but surely. Although they have not been particularly popular so far which has to do a lot with the significant presence of the younger generation that prefers tablets and smartphones over ebook readers. Therefore, content publishing startups like Pratilipi, Matrubharti or Juggernaut have a significant advantage. Another reason to consume content from these app-based platforms is that a lot of Indian language books are not available as ebooks, so there’s no need to buy an e-reader. The Indian ebook segment is an arising market with lots of potential. It is projected to be an 85 million dollar industry in 2016 and is expected to grow 3 to 5 times in the next three years.Ebooks in Indian languages are slowly increasing due to the technological challenges. There’s a lack of support for Indic scripts by the reading devices. However, free content is a key element of adopting ebooks in India. 62% of the publishers are currently publishing ebooks, and the biggest market for ebooks right now is the higher education sector. Although, ebooks at the moment have less than 10% market share in India, according to the projections by 2020 this number is going to be 25%. In terms of self-publishing, we can distinguish two markets in India: books in English and books written in native languages. Kindle has a strong presence in India, and it supports content from Indian languages such as Hindi, Gujarati, Malayalam, Tamil or Marathi. Kobo has a store. However there’s been not much activity happening from Kobo in India. Lately, it is more known for its e-reader than its ebooks. As a self-publisher, there are plenty of options to choose if you want to self-publish a book to the Indian market. You’ll basically become an authorpreneur who has to think beyond writing and have control on all parts of the process. As soon as you publish your books, they will be available globally. Meanwhile, if you go the traditional way, you’ll only responsible for the writing process and don’t have to worry about distribution or promotion. However, it is not easy to win a publishing contract in India. Many people write a book, but only a few can get it published which also takes up a lot of time and the publisher keeps most of the profits. Moreover, the traditional publishing industry in India is dominated by 6-10 big publishers and most of the bestselling authors are associated with them. As for self-publishing in India you have different options and it’s totally up to you how much you are willing to spend on marketing and promoting your book. Cinnamonteal: offers ebook conversion (PDF, EPUB, MOBI formats) and worldwide distribution services Apple, Amazon, B&N etc.). You can also include video and audio clips into your ebooks and create audiobooks as well. For regional languages the biggest players on the market are Dailyhunt and Matrubharti. Dailyhunt is India’s largest local language ebook store that provides books in multiple Indian languages. It offers 20-25% royalties for independent authors and 35-40% royalties for publishers. Matrubharti is a self-publishing startup platform for regional language writers. It uses subscription service for generating revenues and has developed an author community to translate the content from English to Indian languages in exchange for commissions. Content: if your book is written in English, how do you get that translated? One of the most successful self-publishers in India, Rasana Atreya. According to her, if you want to self-publish your book, you need to devote an enormous amount of time for research and preparation to understand the self-publishing process. She also had her books edited, formatted and designed professionally. Rasana’s books based on social issues that affect rural India with a hint of tragedy and comedy elements. She writes about topics that are close to her heart. She also points out the importance of marketing your ebook. She is active on her social media channels, operates a blog page and often asks fellow authors and critics to review her books which can boost her sales. Which genres perform well in India? There’s a high demand for contemporary Indian writing in English. It is easier to sell a nonfiction book in India. As for fiction, it’s a very niche market with an overall rate of 10-12%. The hot topics are social media and startups while self-help and leadership books are evergreen categories. If your plan is to write a book for the Indian market start with ebooks, don’t try to get into the print market. Paperbacks in India are not that profitable because most of them are relatively cheap. How to price your book for the Indian market? Pricing a book right is probably the biggest question every author has come across. Pricing an English book particularly for the Indian market can be an issue. However, what you can do is to use the thumb rule which is usually one rupee (Indian currency) per page for paperback and 60% of it for ebooks. There’s an index called MRP (Maximum Retail Price) for that which is calculated by the type of the print book (Paperback/Hardcover), size of the book and the number of pages. Make sure to actually price your book for the indian market not just convert your local currency price into rupees. Traditional publishers in India offer discounts on the selling price (50-60%), so regarding independent authors, who are trying to adjust their pricing strategy, the MRP index might not be the most profitable solution. In this case, the focus should be more on targeted marketing, finding who your readers are and invest more in that. As you could see, interesting dynamics have been going on in the Indian publishing industry. Self-publishing is becoming bigger and bigger due to the many self-publishing services that have been launched recently, but it still has a long way to go. More and more authors are starting to realize the potential of DIY publishing in India, but there are still issues for publishers to overcome such as book discovery, finding the right price, piracy and investing in strengthening their marketing efforts online. However, the popularity of ebooks is rising in the country, and the increasing number of self-publishing platforms that support authors to write, proves that India is going to be a major player on the publishing market that no one should ignore. PublishDrive is selling ebooks to the Indian market through Google Play, Scribd, Kobo and Amazon. Besides the big retailers, via PublishDrive your books can be published directly to Indian stores such as to Rockstand, one of the largest ebook stores in India. More stores are coming soon! If you have more questions how to publish a book in India, feel free to leave a comment and share it! Special thanks to Amar Vyas, host of MyKitaab Podcast who was a major help putting this article together. Check out his podcasts here.